The title pretty much says it all. Below is what I feel to be the best woodworking video ever made. Why? It is not because of what was made, but because of how it was being filmed. 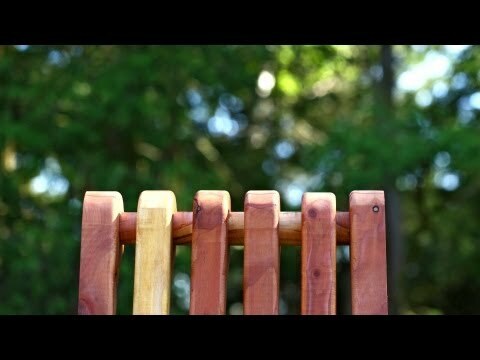 The almost 10 minute video of a chair being built from scratch was shot using only stop motion animation. Below is the video along with the "making of video". This film is the making of a lawn chair from milling the lumber to finishing the chair. The story is told with no dialogue through stop motion animation. The concept for the chair is a striped beach towel hanging over a chair. The film opens with this symbolism and then proceeds to tell the story of the wood being cut, planed, shaped and assembled into the lawn chair. To see the first chair and a description go here: http://youtu.be/Q1HzCZEEsg4 And the addendum video http://youtu.be/pSESmisWDnk to see the making of video: http://www.youtube.com/watch?v=ALjdGFDLpYI I took about 12,000 frames. I used a Cannon 5d3 with an EF 16-35mm f/2.8L and EF 100mm f/2.8L Macro Lenses for all the photography The Soundscape was completely built in post production.